"The Midnight Visitors" is a cute story of the night that Jesus was born from the view of a cow, named Miriam. I sat down and read this book first to make sure it was something I thought my 6 & 4 year old would enjoy. Each night we ready a story from 3 different books, one being a children's Bible & while we love reading those, it was fun to read a new Christmas book to them! Miriam had a few other visitors before Mary and Joseph. When I read the book the first time...there was a point where I was starting to wonder if they would even show up. They do appear towards the end, after Miriam has already taken in a few other friends. There were a few things I didn’t like; 1) when the shepherds show up one of them calls out to Mary and says “hey lady.” I’m not sure why he is made to be rude but it was kind of unnecessary in my opinion. 2) I thought it was strange that even though they say Mary is pregnant, she doesn’t look pregnant at all, not sure why the illustrator would choose to do something like that. In the end my girls really liked this book. 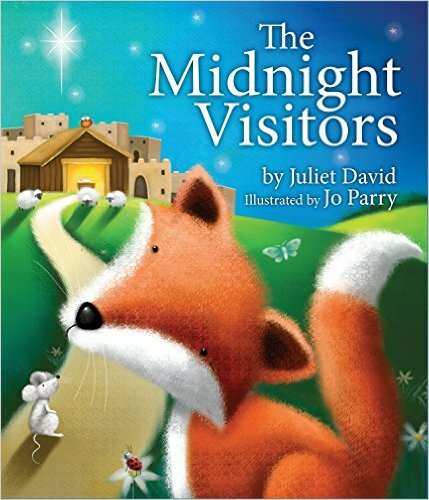 The Midnight Visitors is a cute version of story.